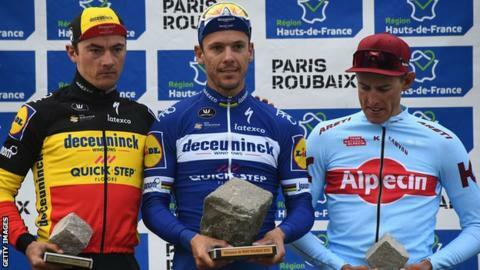 Belgium's Philippe Gilbert won the Paris-Roubaix to secure the fourth 'monument' title of his career. Former world champion Gilbert beat Germany's Nils Politt in a sprint finish to win the 257km race in five hours 58 minutes two seconds. Gilbert's compatriot and Deceuninck-Quick-Step team-mate Yves Lampaert finished third. The five monuments are cycling's most prestigious one-day races - Gilbert has won them all except the Milan-San Remo. "I still have this dream to win all of them. Little by little I'm getting there," Gilbert said. "Politt's very courageous. In the end the best rider won, and thankfully it was me," Gilbert added. Only three riders have won all five monuments - Belgian riders Rik van Looy, Eddy Merckx and Roger de Vlaeminck.